By the 19th century the field of optometry was more advanced and more scientific than ever before. Scientists had developed the concave lens as well as bifocals and trifocals. Monocles were popular at his time as was the pince nez, lenses that sat on the bridge of the nose but that were not supported by arms. There was an enormous variety in styles available; round, oval, square, attached by ribbon or a chain and there were even a variety of colours offered. 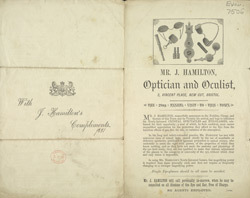 The illustration on this leaflet depicts many different types of glasses from monocles to telescopes.